Shikha Paul Department of Microbiology, Sir Salimullah Medical College, Dhaka. Sanya Tahmina Jhora Department of Microbiology, Sir Salimullah Medical College, Dhaka. Prashanta Prasun Dey Department of Endocrinology, Kumudini Hospital, Tangail. Bilkis Ara Begum Department of Microbiology, National Institute of Cancer Research and Hospital, Dhaka. Keywords: Bangladesh, ESBL, Gram Negative Bacteria. Detection of Extended spectrum beta lactamase (ESBL) enzyme producing bacteria in hospital settings is vital as ESBL genes are transmissible. 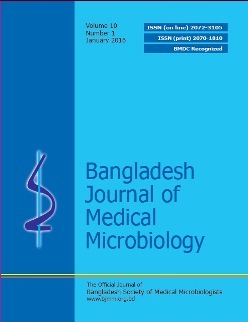 This study was carried out to determine the distribution of ESBL producing gram negative isolates at a tertiary care hospital in Dhaka city which deals with the patients hailing from relatively low socioeconomic status.Onehundred and twenty four gram negative bacteria isolated from different clinical specimens from outpatient and inpatient departments of Sir Salimullah Medical College and Mitford Hospital (SSMC & MH) were tested for ESBL by E test ESBL method in the department of microbiology of Sir Salimullah medical college (SSMC) from March 2013 to August 2013.Out of 124 gram negative bacteria 69 (55.65%) were positive for ESBL. Among the ESBL producers, Esch.coli was the highest (46.38%) which was followed by Serratia spp (11.59%), Enterobacter spp (10.14%), Proteus spp, (8.70%), Acinetobacter spp. (7.24%) and Klebsiella spp.(5.79%). Out of 32 Esch.coli isolated from outpatient department, 10 (31.25%) were positive for ESBL. On the other hand out of 27 Esch. coli isolated from inpatient department, 22 (81.48%) were positive for ESBL. The difference was statistically significant (p<0.001).So the present study reveals that the distribution of ESBL producers is more among the hospitalized patients than the patients of the community.